At the risk of sounding like a broken record, always chanting about the beauty of New Zealand, I must admit my appreciation for its natural beauty only seems to be escalating. The fascination to visit New Zealand intensified when I watched the trailer of Lord of the Rings (especially when I saw the trailer for The Fellowship of the Rings). Now that I am here, I can understand why the film makers not just Lord of the Rings makers, but also others across the world choose this country for their work. The plush meadows, rolling hills and the many rivers and lakes is the perfect answer for many film makers scouting for “THE” perfect location. Be it for romantic walks alongside dreamy blue beaches, action and suspense on the wildest treasure hunts, or mysterious disappearances in the bush, or fantasy where pixies come alive under the white silver moon, or the eerie feel of haunting amidst shadows of giant-sized trees, or better yet sets for the likes of war films, epics, documentaries or dramas to show the magnificent sprawl of land with its bountiful space, NZ is the answer to all of the above and more. 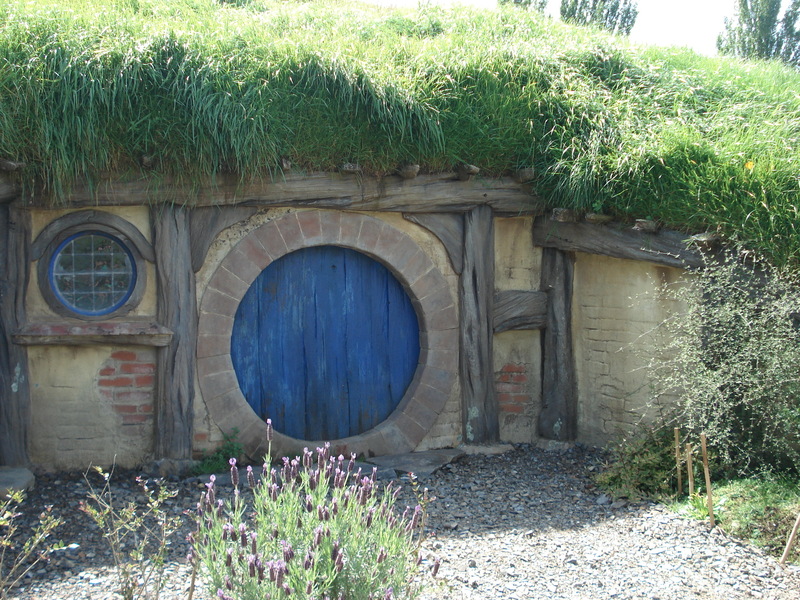 I had this wonderful opportunity of visiting Matamata with my husband who found an awesome deal to visit Hobbiton online. 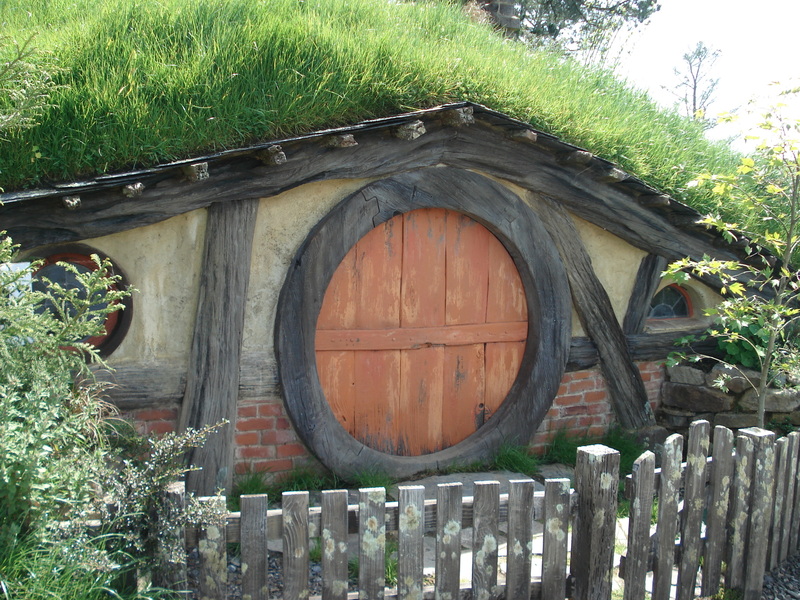 Matamata is known for its thriving farming and thoroughbred horses and that which boasts one of the largest farms which was the very setting for the Hobbit village. A farm converted into a Hobbit set. You may think “what’s so great about that?”. May sound mundane, but the work that has gone into it to create the set was huge. 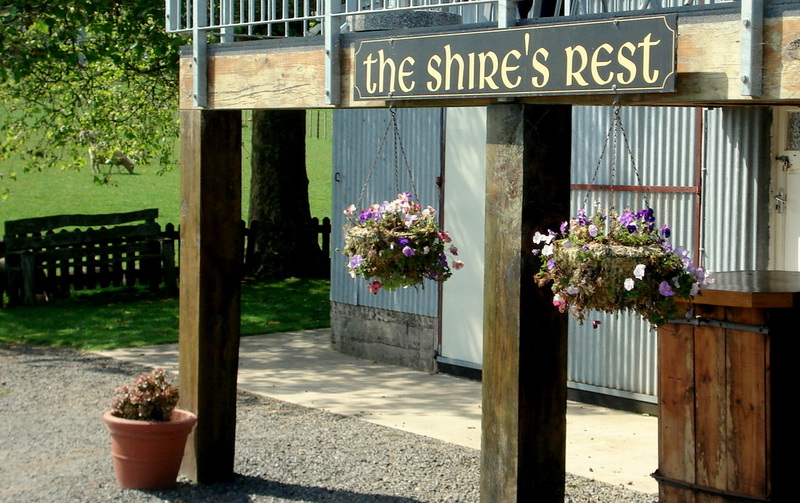 We started our tour from the Shire’s Rest, gave our tickets to the guide and boarded a bus. And it struck me that its been aeons since I’d last been on a bus and remembered my college days only too well and the groans and back pains after a bumpy ride in the bus. But fortunately bumps were very few this time round. 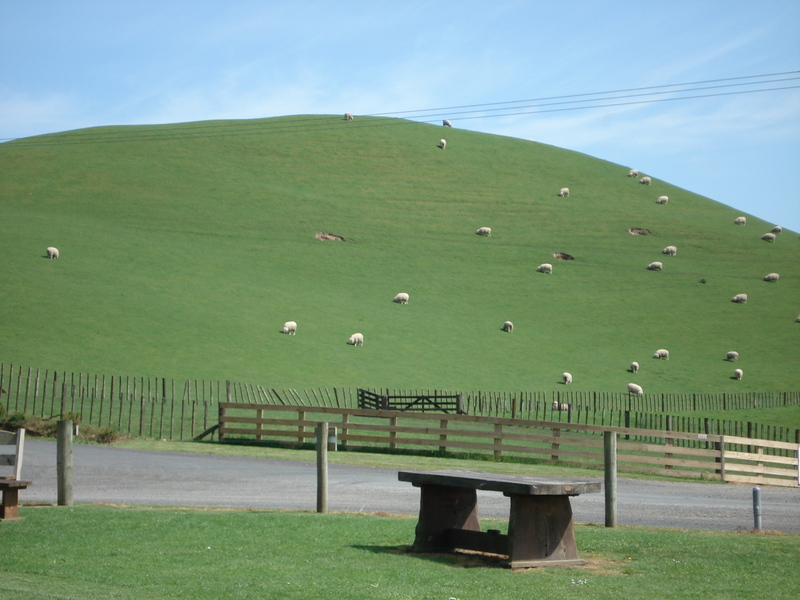 We rolled up the farm tracks watching the many white dots decorating the lush green paddocks. And by white dots I meant sheep. The tour guide was chatting away on his microphone with his tourists throughout the bus ride about the films. One thing in common amongst all the tourists on the bus was that everyone (except maybe the kids) had watched the movies and/or had read the books. To add to our fortunes the ever unpredictable kiwi weather seemed to be tour friendly with the late spring sunshine beaming down on us wiping out the chill in the air. It was just perfect for the 1.5 to 2 hour slow trek up and down the paddocks and low hills. With an ado about safety and acceptable behaviour from the friendly tour guide, we marched on. 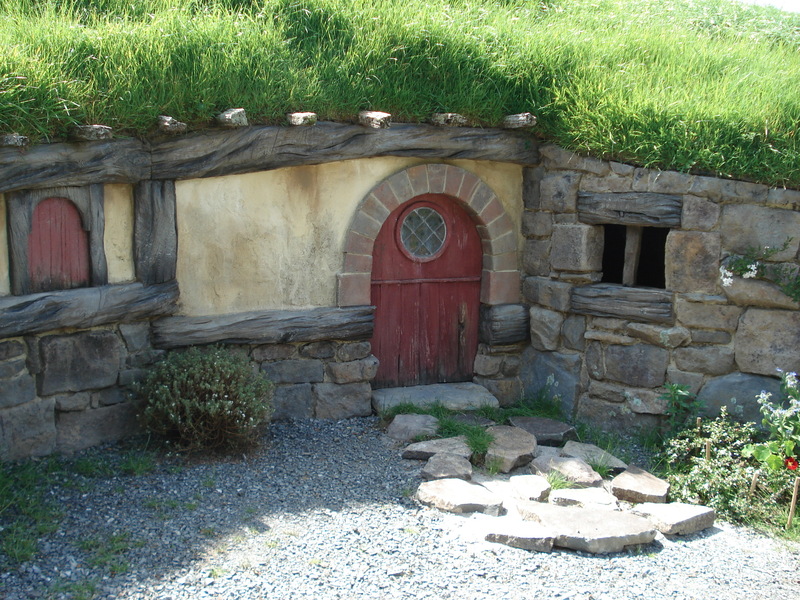 We visited the homes of Bilbo Baggins, Frodo Baggins and Samwise Gamgee and many more featured in the film. Apparently the people who built the set had to literally cut into the hills to create holes and ploughed the dirt and roots out. And started building these home like structures. They are quite narrow if you enter them, one will barely have space to fit more than 3 individuals in a horizontal line. And only of one of the hobbit holes were made larger than the rest as they wanted an angle from within the Hobbit hole looking out at the scenery. 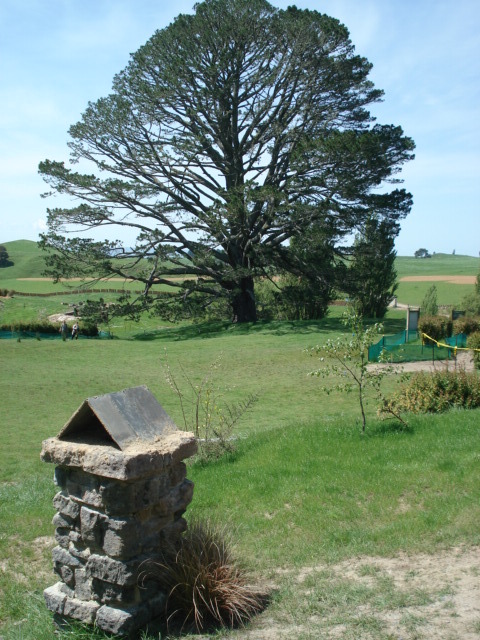 Another landmark from the film was the perfectly symmetrical oak tree which apparently caught Peter Jackson’s eye which also tipped the scales in this farm’s favour in terms of becoming the location for Bag End. Because the tour was conducted in a relaxed and cool pace I was not even tired. While we were waiting for the bus to arrive, the tour guide who was armed with a stock of interesting anecdotes and snippets about Lord of the Rings trilogy and Tolkien fanatics shared a couple of interesting cases of fan frenzy. One of them was about a couple from overseas (he thinks they were probably of Norwegian or Swedish descent) visited Hobbiton. The husband and wife duo spoke Elvish. And the husband was the only one who spoke English, his own native language & of course ‘Elvish’. He translated the tour guides dialogues to his wife in Elvish, which many of them found amusing but took it in good spirit. The other was another extreme. A fan bought a $750(NZ $$$) gold ring like the one in the movies, that was sold at their souvenir shops and took a scenic flight over the mount where Mordor (Mt Ruapehu in NZ) was filmed and dropped the ring from the aircraft. Hows that for crazy? Gold melting idiot I’d say. As if on cue the bus arrived just as the story ended. And we trudged back revelling on the experience we just had. We left the Hobbiton immediately and went to the city centre to have Pizza from a local Pizzeria – Power Pizza that sated our ravenous hunger. And the pizza was surprisingly good. And we also had a tangy soft drink – Frank’s Blood Orange which was the perfect solution to quench our thirst(given that we were parched after the trek). This is a must see place for the Lord of the Rings fans. I highly recommend a trip to the Hobbiton Movie Set in Matamata. They also have packages including Sheep rearing shows, Farm stays etc. Do check out their website for more information. My South Island tour of the movie set is still due (the one with the Gates of Argonath pictured at the top of the page). Hopefully in the next couple of years. On the whole the long weekend was well spent and well worth it!!! It is so fantastic to hear about my home country (NZ) from a tourist perspective in such a positive way. I love my country, but it really is something else to hear people from other parts of the world who can truely appreciate its beauty.